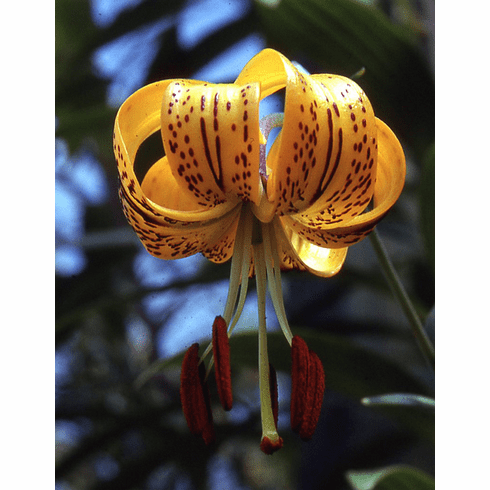 The golden yellow variant of Lilium amabile is believed to be a recessive mutant of the type. It is reported that this species first appeared in Holland from wild collected seed. Yellow forms crossed amongst the group will continue producing yellows. Photo inset #1 is the Asiatic Hybrid 'Ignacio' bred by the late Don Egger, selected and introduced by B & D Lilies in the late 1990's. Photo inset #2 is of a bed of 'Harlequin Hybrids' that were bred out of the De Graaff 'Mid Century' hybrids of which 'Enchantment' is the best known. Derek Fox of England in his book 'Growing Lilies' said that when looking at L. amabile var. luteum for breeding it was this species that provided the yellow shades in the 'Mid Century' selections. Eddie McRae wrote that "The 'Harlequin Hybrids' were also a result of 'Edith Cecila' and 'Lemon Queen'". This photo was taken by Herman Wall sometime in the mid to late 1950's. Mr. Wall did much of the photography for the old Oregon Bulb Farms and this photo was provided by Eddie McRae back in the early 1980's for use in one of our catalogs. Insert #4 is photo of the 'Hummingbird hawk-moth' (Macroglossum stellatarum) feeding on 'L. amabile var luteum'. Photo taken by and copyright Pontus Wallsten, all rights reserved. Used with permission.